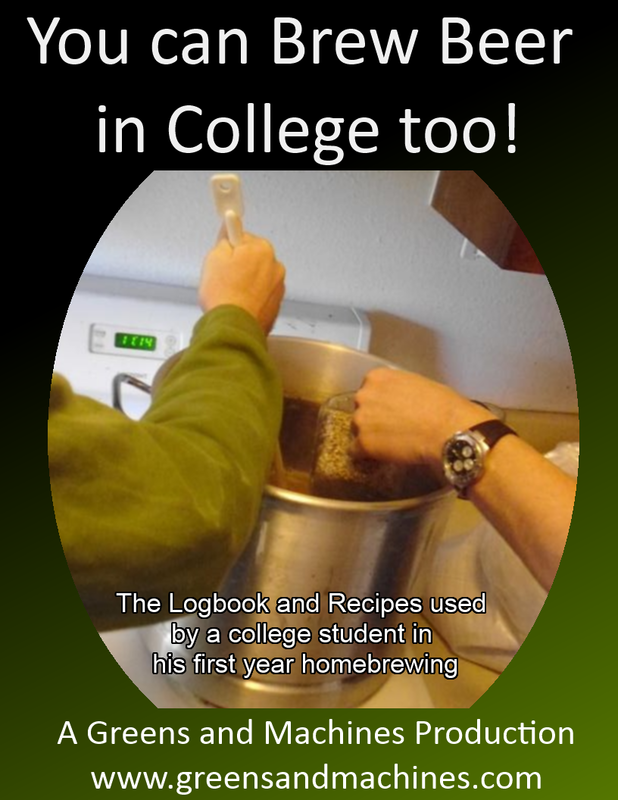 "You Can Brew Beer in College Too!" Both extract and all grain recipes are included in this book. All my beer making experience from the past year is now conveniently compiled and organized into 1 pdf, so you can enjoy it all at once or when you're not connected to the internet. Follow along with over 160 photos of homebrewing excitement! Enter your email address and receive your copy today! 1 week after adding in the vanilla beans to our vanilla porter, it was time to bottle. I was pleased that the beans did not introduce any harmful microorganisms to our brew. The first wiff I took from the fermenter was sulfury, but it dissipated quickly to give strong chocolate and vanilla scents. This is one of the better smelling beers we have made and are proud of it. I haven't given a garden update this month yet, mostly because the it's been raining really hard for the last week. The weather this week feels like spring has finally arrived though; the forecast predicts a few days above 70 this week. I only think this is going to happen because of the cloud cover. Because of this though, nighttime temperatures are predicted to be in the 40s. Let's go through the garden. Homebrewing is a great hobby to take up. Trust me, I do it and I love it. It's especially fun if you can get your friends to help you out or encourage your brewing. There are a lot of thing that everyday Joe doesn't know about brewing, so you'll be bound to answer their every little question about your brew. I've had to answer plenty of questions, and many of them being the same from person to person. Here is my list of 6 commonly asked questions about homebrewing. Yay for no infected beer! In this episode I put the finishing touches on the die casting mold for the soap dish. Evidently, the reamer I had used in the CNC machine was not exactly .500", quite smaller, so I had to re-ream the dowel holes with an actual 1/2" reamer. Amazingly, the dowels lined up on both sides unlike what I had predicted. Its bigger than my table! Now that your beer has finished fermenting, how do you store it? There are two paths you could take, kegging or bottling. If you are starting out, you're most likely going to be using the cheaper option of bottling. How do you get your beer in the bottle and what must you do to ensure your beer gets carbonated? Kale is one of those plants like Swiss Chard, except it is in a completely different order. It's more similar to a cabbage than it is spinach or chard. This variety of kale is really easy to grow. As long as it gets water and some nutrients, the leaves will grow large. My favorite way to prepare kale is to make chips; shred the leaves, drizzle with olive oil, and cook in the oven at 275F for 25 minutes. Most new bicycles come with warning stickers on them saying things like "WEAR A HELMET", "DO NOT RIDE AT NIGHT", or "CHECK BRAKES". Obviously this is to protect the manufacturer from liability if something terrible happens, but I think it would be helpful if they also had a sticker that said "Make sure seat and handlebars are high enough" or "Remember to inflate tires"
I say this because it disappoints me to see people riding on uncomfortably adjusted bikes or with tires half inflated or even worse yet, with the fork installed backwards. Not saying that I am the master of all things bicycle related, but I have learned some things from experience that I wish I would've known much, much earlier. When I was looking through my fridge today, I thought it would be a good idea to have some hamburgers. However, I had no hamburger buns, meaning I had to improvise. My waffle maker was on the counter, so I decided to use that to make some flatbread buns while my oven was occupied by the burgers. Have you ever wanted to grow some vegetables for yourself? Here is a short summary of a quick and easy way to start a reasonably sized container garden for less than $25. There is no one method to start growing food. You don't need to be a farmer to do it. You can have a vegetable garden in nearly any location, no matter how little space you have. There are cheaper ways to start a garden than the one here, but it this method provides plenty space for the cost and is basic enough to adapt to different budgets, materials available, and climates. Hooray it is time for another brew day! Today we are making a porter to redeem the one we lost last time due to infection. Since I still have vanilla beans, I decided it was time for a vanilla beer. There are a few things that we have decided to do different today. First we are using less grain, 11.5 lbs, as we have learned the upper limit of our mash tun is around 13 lbs. Second, to achieve better starch conversion and not have a repeat of the IPA, our mash will last for 90 minutes instead of 60. Finally, we will be reusing some of the Burton ale yeast from the brown ale we made last time.